This is the latest EP from Swiss post-black metal band Schammasch. Oh, Schammasch. You never quite know what they’re going to do next. Their last album, the colossal and immense Triangle, was so good it made it to the second position in my best of 2016 list. After such the huge achievement that Triangle undoubtedly was, it would be easy for the band to rest on their considerable laurels. Instead, they’re back once more with a new collection of songs that again sees the band continue to develop and grow as artists. First off, there’s 30 minutes of material here, so this could almost be considered the fourth third of Triangle, (you know what I mean…). It isn’t though, of course, as The Maldoror Chants: Hermaphrodite is its own beast, and has its own infernal direction. On The Maldoror Chants: Hermaphrodite the band develop and evolve their avant-garde approach to black metal to the point where they’re now readily wading through exploratory post-metal waters. 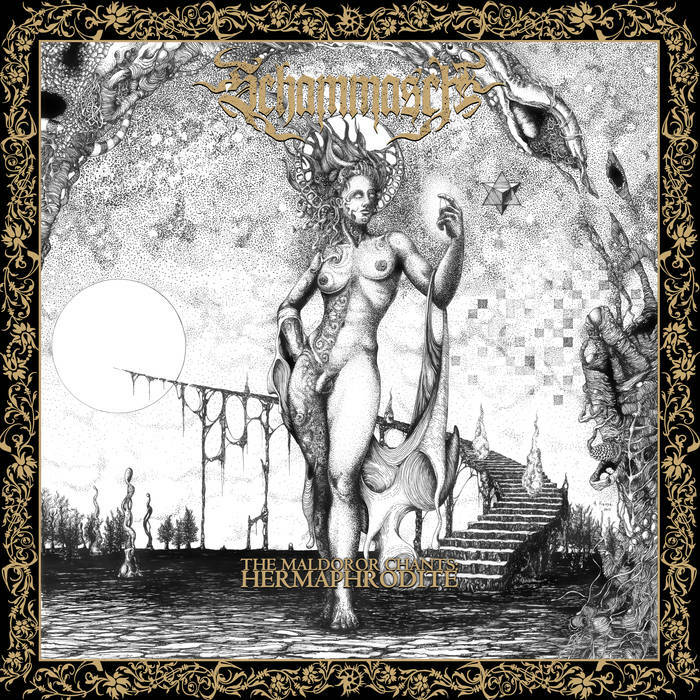 A flimsy, nebulous genre-tag such as post-black metal doesn’t really cover it, as at this point in the game Schammasch largely just sound like themselves. The music on this release is experimental and tentative, but without lacking in confidence. This is the sound of a band spreading their wings even further than anything they have done before, and finding that they like how it feels. With atmospheric doom and drone vibes permeating the blackened occult feeling, the songs on this EP are strongly indicative of something with depth and great importance, as if you’re listening to something unfold that has the power to shape the future course of events for an entire world. Mixing the three distinct styles found on Triangle, and adding even more than that, Schammasch have ably demonstrated that they’re not a band to sit still and stagnate. Of course, we already knew this, but The Maldoror Chants: Hermaphrodite reinforces this with style and substance. This EP is heavily atmospheric and very weighty. This is not frivolous, lightly digested, or easily discarded music. This is a work of art to be consumed slowly, savoured and considered as it delivers its 30 minute payload. Impressively delivered and masterfully realised, Schammasch have started a new chapter with The Maldoror Chants: Hermaphrodite. I can’t wait to see where it takes us. This entry was posted in Black metal and tagged Atmospheric Doom, Avant Garde Black Metal, Black metal, Doom, drone, Metal, Post-Black Metal, Post-Metal, Schammasch. Bookmark the permalink.